It’s time for another Cute Outfit Ideas of the Week! This one is dedicated to one of my favorite fashion trends – boho clothing. The boho style trend is big for this spring and was seen on the fashion runways. Designers such as Valentino and Vera Wang showcased the trend with gorgeous evening dresses. I have several boho shirts and they get quite a bit of wear during the spring. They’re roomy, comfortable and add a touch femininity and romance. I purchased this shirt at a Charming Charlie’s Black Friday sale. Get ready for this…I paid $5. Yes, $5! That’s my kind of fashion find. 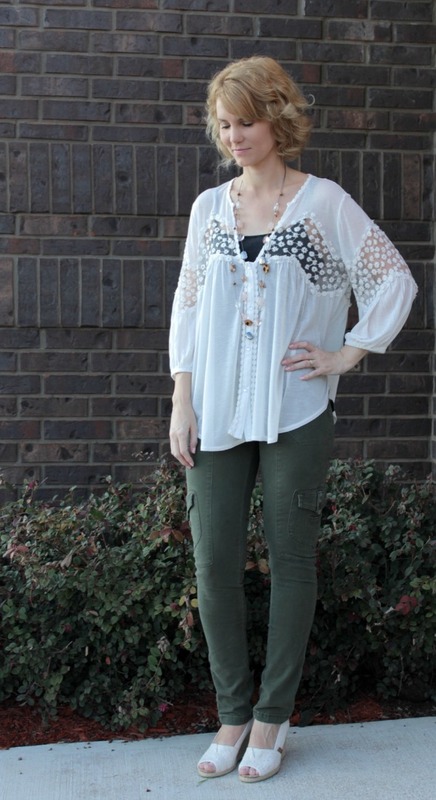 I paired it with Union Bay Skinny Pants, Madden Girl Wedges and very minimal jewelry. Boho clothing is a laid back, no fuss style. As I said, I’m very fond of boho shirts, but this spring I’d like to break out into some boho dresses and pants. Here are a few cute outfit ideas I styled featuring boho clothing. This is the perfect laid back boho style. You can’t go wrong with a black and white printed pant, black camisole and fringe cardigan. 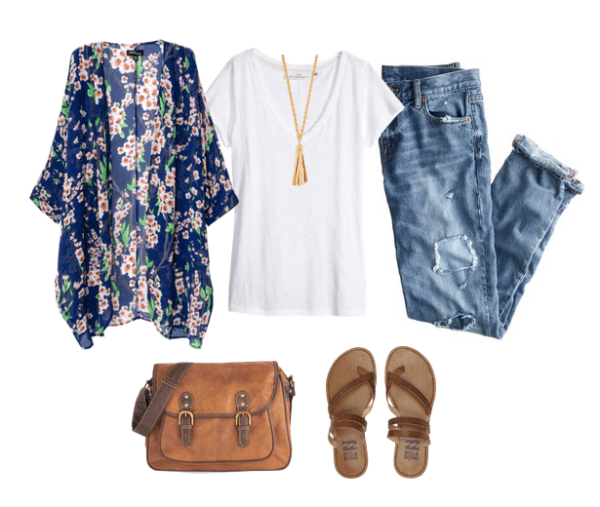 This outfit idea is great for an afternoon of shopping or catching a concert at your local festival. The fringe handbag sends this outfit over the top with boho style. By pairing all neutrals together, it gives this look a calm vibe. If all neutrals isn’t your thing, throw on a colorful cardigan or accessories. One of my favorite looks for spring is pairing a kimono with a pair of jeans or shorts. It takes a simple outfit and makes it super cute and feminine. You can balance out the femininity of the kimono with a leather handbag and sandals. Also a must for an outfit like this, a tassel necklace. Are you ready to break out the boho clothing and embrace this spring trend? Which outfit idea is your favorite? I love the BOHO look, these combos are awesome! And what a steal on that shirt I love it!